There is a secret society in my little town. I noticed when I had a little party a few months ago. I invited some friends over for a Crepe Fest. My directions to friends were “Bring your favorite crepe filler.” When people walked in the door and set up their food I noticed something. Two brought beets. I said nothing. I acknowledged to myself that I was starting a new secret club– the “We aren’t afraid to eat Beets” club. Beets are underrated and misunderstood. When I was in elementary school in Thatcher, Idaho (google it), canned pickled beets were a common item. Much to my schoolmates’ dismay, I liked them. A lot. As an adult I bought them in secret, prepared them in secret, and ate them when no one looked. But I will be silent no longer. More of us like beets than we want to admit. I have a recipe for beets that is so good, I can no longer order beets in restaurants (and I’m talking about fancy eateries). And so friends, its time for you to grow up and abandon your childhood hatred of the purple beauty. 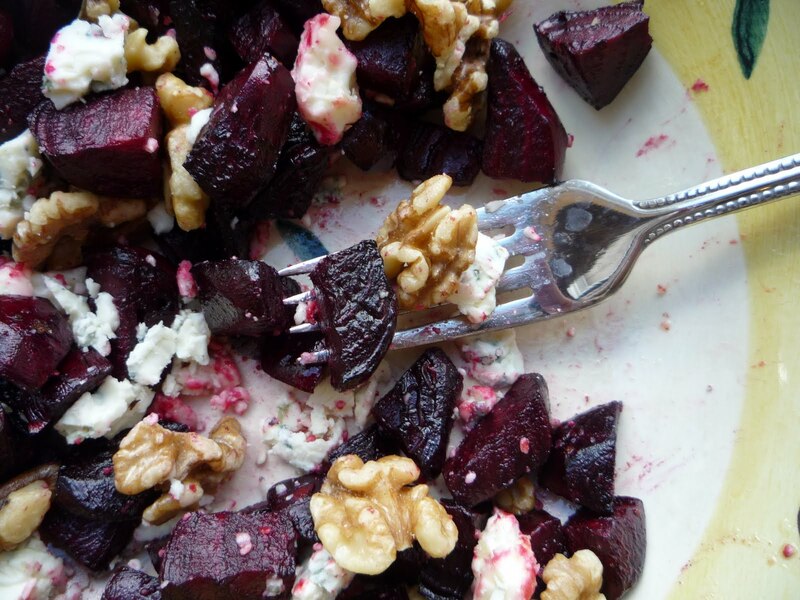 Reintroduce yourself to sophisticated beets. Lightly grease an 11×17 cookie sheet with olive oil and set aside. Prepare your beets. 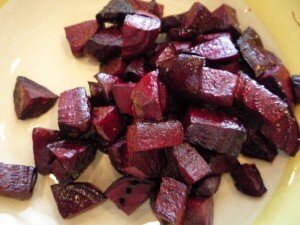 If you haven’t worked with beets in while you will be surprised at how intense their color is. You’ll want to wear an apron and be prepared to stain whatever you chop them on. Peel each beet with a potato peeler, then dice as you would a potato into 1 inch squares (use a good knife and a decent cutting board). Toss diced beets with 2 Tblsp. olive oil. Spread beets in greased jelly roll pan or rimmed cookie sheet. Sprinkle with a bit of kosher salt. Roast beets at 450 for 15 minutes or until tender. When tender pierce of fork, remove from oven and toss with crumbled gorgonzola and walnuts. Eat to your heart’s content. I often serve this as a side dish with grilled chicken and tossed greens. Man writing this is making me hungry. Oh Beccs I like this. I like beets. Ryan, not so much, but only because of an experience in South America after eating too many beets. Maybe this will be the recipe to reintroduce beets into his life. Do you think feta cheese would be tasty? In addition to being delicious, red beets have some serious anti-oxidant power to them (from the red/purple coloring). So, it’s time for beets to return to a place of honor at our tables. Bravo Beccs!